One of the worst aspects of having food allergies is the hassle it can cause when you want to treat yourself to a meal in a restaurant. It can be a stressful experience trying to avoid exposing yourself to the symptoms of a food allergy if you have no control over the cooking and preparation of your food. Fortunately, there are things you can do to make sure the risk is minimized. 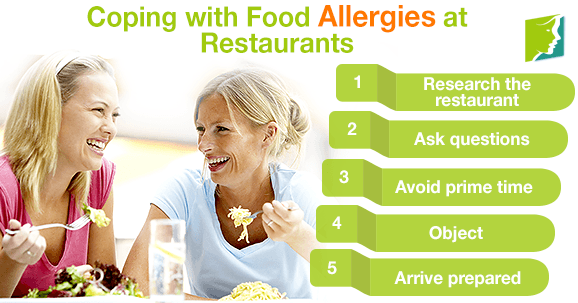 Keep reading to discover the top five ways of coping with food allergies at restaurants. One of the best ways to keep your food allergies under control when eating outside of the house is to do your research about the restaurant you are planning to attend first. Find out if they have a good reputation for catering for individual needs, and look online to see whether they receive good reviews for attentive service. Don't be scared to ask your waiter or waitress as many questions as you feel necessary to assure yourself that your food allergies are being taken seriously, and that the restaurant is capable of catering for them. Find out how the food is cooked and what ingredients are used in it. Make sure you avoid tasting any of the meals other people in your party are eating, even if they don't seem to contain any of the foods you are allergic to, in case they have been cross contaminated with foods you are allergic to. If you can, try to reserve your table for earlier or later than prime time. This way, the restaurant should be quieter and you will be given more time and attention by your waiter, allowing you to ask them everything you need to be as certain as possible that none of the foods you are allergic to will find their way onto your plate. If your plate of food arrives and you feel unsure that everything is as it should be, then be brave enough to object and send it back to the kitchen if needed. If a mistake has been made with one element of your meal, make sure it is replaced by an entirely new meal so there is no risk of cross contamination on the plate. Make sure you bring along whatever treatment your doctor has prescribed (like emergency epinephrine), just in case any food that you are allergic to manages to wind up in your meal. Also, know the signs of allergy you might have. Food allergies can make a trip to a restaurant complicated and difficult, but they don't have to be. Fortunately, there are things you can do to ensure that you have an enjoyable meal without any worry. These five tips for coping with food allergies at restaurants will hold you in good stead. Read about hidden triggers of food allergy. Dust allergies can worsen during menopause. Learn more about how to lessen their symptoms naturally.